Manny Friedman is the founder of EJF Capital. Manny discussed his background and his nuanced take on markets last summer in Episode 61 of the podcast. In that conversation, he mentioned a new regulation in the U.S. that created an area of investing called Economic Opportunity Zones. I started learning about Opportunity Zones from Manny and dove in for my day job. 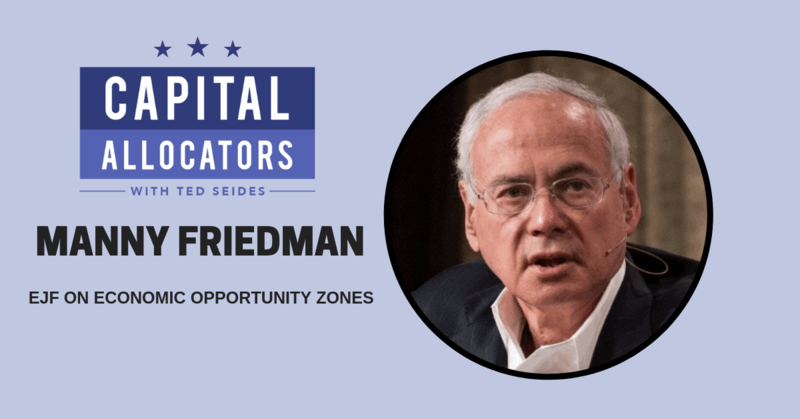 Since then, more and more eyes are viewing investments in Economic Opportunity Zones, and we sat down to get his perspective at the Context Summit in Miami, amidst a sea of allocators and hedge fund managers. Our conversation covers the government’s broad, bipartisan effort to reallocate capital to underinvested areas of the country, how tax incentives will potentially unlock trillions of dollars of unrealized capital gains, the future attraction of Economic Opportunity Zones to nontaxable and ESG investors, the ways in which the program could fall short of its lofty goals, and specific examples of how a virtuous circle can get created and make a meaningful dent in the economic divide in the United States.